Specimen holding tanks used by Doc at the the rear of the lab. The memorial at Drake Avenue and Wave Street was erected in memory of Doc Ricketts who died after being hit by the Del Monte Express train, while driving across the railroad tracks in his car in May of 1948. The memorial was erected by the Cannery Row Foundation in 1979. Bronze portrait of Doc Ricketts holding a starfish. 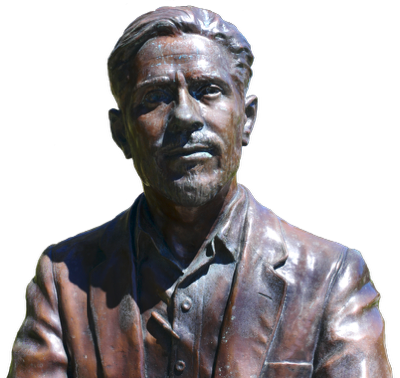 Dr. Ed Ricketts was the real life friend of author John Steinbeck who inspired him in developing the character, Doc in several of his novels. Doc is perhaps best remembered in both Cannery Row and Sweet Thursday among several other works by the author. The character portrayed as a marine biologist closely paralleled the real Ricketts' life. 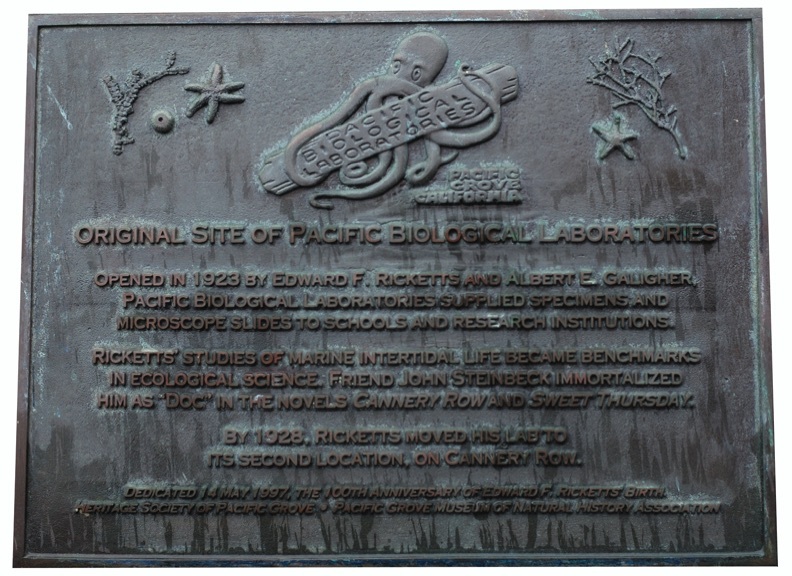 The Pacific Biological Laboratory (1928-1948) was run by Ricketts up until his untimely death a few days before his 51st birthday. He died three days after being hit by the Del Monte Express train on the evening of May 8, 1948 when his Buick sedan stalled on the tracks at Drake Avenue and Wave Street near his laboratory. 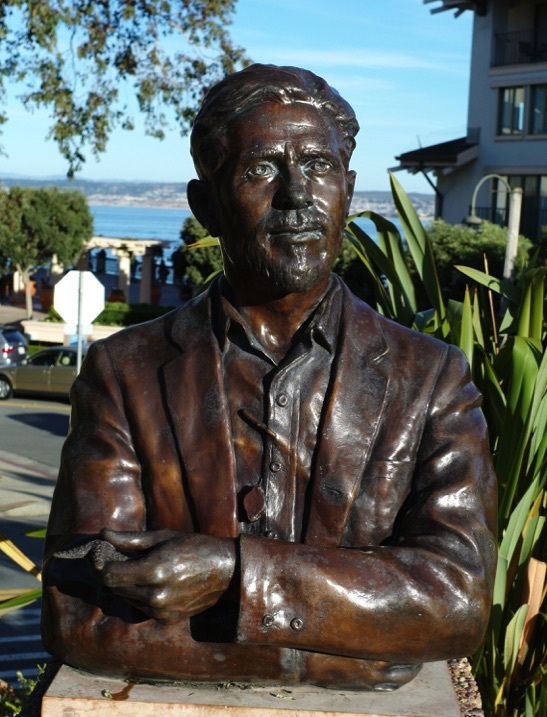 Today, the city celebrates not only Steinbeck, but Doc as well, with a touching memorial at the scene of the unfortunate accident along with the lab building on Cannery Row. Tours are conducted through the lab and living space so that you can experience what Doc did and how he lived. After Docs death in 1948, the Lab building was purchased by Yock Yee, the owner of the Wing Chong Co. a grocery store across the street from the Lab. 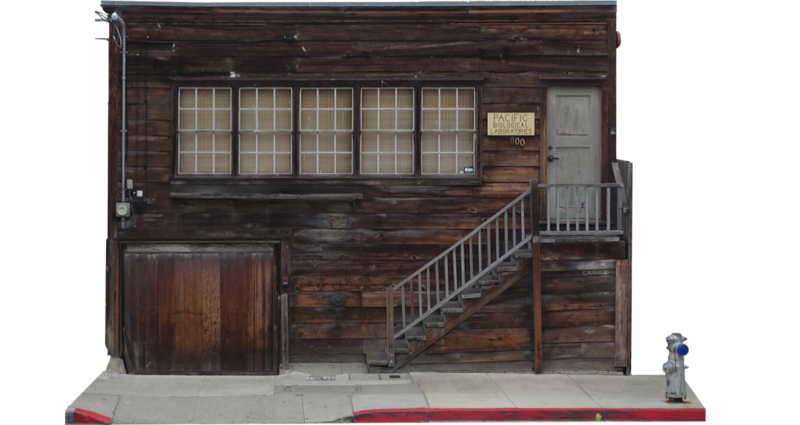 The store and its owner Wing Chong also played important roles in Cannery Row and Sweet Thursday. In 1956, the Lab building was sold to Harlan Watkins, who after living there for awhile, formed the PBL Club (Pacific Biological Laboratory) for he and his friends. In 1957 the idea of the Monterey Jazz Festival was first developed there by Jazz promoter Jimmy Lyons. By 1958, ten years after Doc's death, the club purchased the building and in 1993 they in turn sold it to the city of Monterey. Ricketts' home on Cannery Row built in 1937 to accommodate his lab below. Oringinal 1923 site of Ed Ricketts' Pacific Biological Laboratories in Pacific Grove. Asilomar beach where Ed Ricketts' collected animals from the tidepools. The plaque on the building denoting the history of the building. A second bronze portrait of Doc Ricketts holding sealife. Ed Ricketts' final resting place at the El Encinal Cemetery, Monterey, CA.